Let's talk about Terry. Someone is going to need to talk about Terry at some point. Terry has issues. Terry is a bit of a porker. Terry likes to eat out of bins. There's little hope of his wife June sorting this little foible out - June likes to eat out of bins too. Terry and June live in Bexhill-on-Sea. I don't know how long they've lived in Bexhill. I've not yet managed to ask them, they're usually to busy with the bins. Terry and June are herring gulls. Their favourite foods are Pringles, nappies and Chinese takeaways. Terry loves the noodles. Over the Easter weekend I got to see Terry and June at work. It wasn't easy for them as the wet weather rendered the bin lids slippery, but it's in moments of adversity like that where you get to see the real masters at their best. They gave those bins a really good going over. I watched them in some awe. By the time they'd finished with bin one the black bin liner was pretty much entirely absent. I don't know what they did to achieve that or what they did with it afterwards: maybe their nest will be the only one in town with a dedicated wetroom or pond. 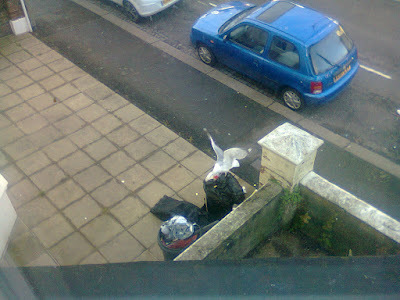 This morning, though, all the most delicious parts of that bin had been exhausted and they were on to bin number two. This was more of a breakfast bin. Terry and June look quite well on it. They are of formidable size and their feathers are the kind of feathers you'd see in some sort of feather museum or on Princess Anne's hat for Royal Ascot. Of course, the socially-minded people are disgusted by the mess they make, flinging bits of plastic (too chewy) and paper (not enough flavour) about the streets in order to get to the best bits. But it's well known that humanity wastes a scandalous amount of food and so Johnny and Sally Streetpride might well consider that, instead of investing in more secure bins, they should perhaps be less keen to throw away a whole roast chicken dinner because Johnny bought the wrong type of potato. Until that glorious day comes, these exciting urban ecosystems will continue to flourish. I celebrate them! I am full of admiration for the gulls and pigeons and the foxes and rats and how they have adapted and learnt to thrive. I only really have two reservations. Firstly, I wish that foxes would learn better road sense. Of course, the crows don't, which creates another urban ecosystem in itself. Secondly, I am forever mindful that evolution is a funny old goose. At the moment the sparrow who sidles up to your park bench asking for a bit of crust is a charming little opportunist. But yesterday I watched a sparrow, bold as brass, waiting around a van which sold hot pork sandwiches. If he'd been packing heat, no banger would have been safe. My friend Moll has already reported to me a sighting of a pigeon in Brighton chowing down on some chicken from a discarded wrap, so it's clear that the birds are moving away from their traditional meaty treats of worms and things with five or more legs and onto the more readily available array of cooked comestibles discarded by us lot. How many long before sparrows form a posse and fly off with a pig of their own? Or maybe they'll evolve one big wing, ready to fell us with a right cross and steal our baguettes? In so many ways we are living in a golden age. I'm doing my best to enjoy it before two foxes with a snooker ball in a sock mug me for my dinner.